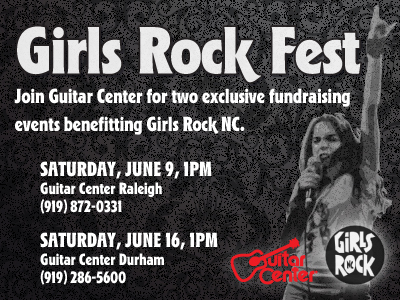 We had a fun time in Durham at the Girls Rock NC festival. Thanks to Louise, Hannah, the rest of the organizers, and Heather McEntire of Mount Moriah fame who said we were the perfect Girl Rock NC band and asked us to come back up for a camp and mentor the kids! Sure, we’re a couple of overgrown kids ourselves! You rocked. I really enjoyed your music. Thansk for helping Girls Rock. my daughters were riveted and snobby guitarist husband- very impressed and that is not easy to do! hope to see you playing around the triangle again soon. Thanks you guys!!! We got asked back up to play/mentor for Girls Rock. Cool! We’ll be playing in Raleigh a couple times in September. Julie, message us with your email address so that we can let you know when we’re up your way.